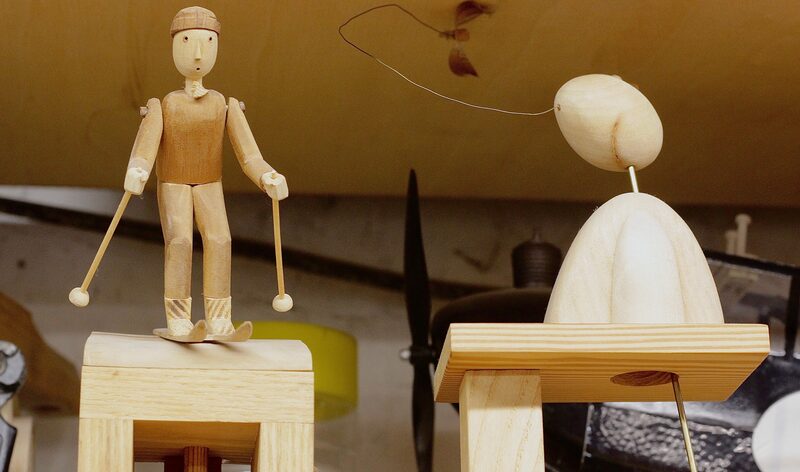 The Face of a Wooden Automaton created by Mirek Trejtnar. And so I was in Prague to meet puppeteers. I had an idea to get a last round of interviews for Gravity From Above before going to Tbilisi to start editing. I wanted to get caught up on Czech puppetry since my last serious round of interviews in 2012. (I was also here in 2016 but that was more to capture performances.) And changes had occurred since then. One of the more serious changes in the landscape of the Czech puppet was that Josef Krofta had died in 2015. Krofta more than any other director in Czech theatre had changed the presentation of puppetry. The actor now came out from behind the stage to perform with the figures. His passing signaled the end of an era. A rather alien Christmas from Buchty a Loutky. Another change had occurred over at Loutkář (the Czech word for puppeteer), the first serious puppetry magazine in the world and still in existence after over 100 years. Nina Malíková, daughter of famed puppeteer, historian and theorist Jan Malik, had been editor-in-chief for many years, but she had stepped down to allow Kateřina Lešková Dolenská to take over the post. And while in 2016 I had only briefly met Kateřina, so briefly that I hardly remembered her. I decided that it was time to formally make her acquaintance and to conduct an interview. Kateřina Lešková Dolenská Editor-In-Chief at Loutkář. Thus I spent a couple of sessions with Kateřina at the offices of Loutkář on Celetná Street in the heart of Old Prague. Again I find it curious, if you look down from the windows onto Celetná you see the aimless tourists, but inside I was connected to the real world of České loutkářství (Czech puppetry). In a simple office with shelves filled with copies of recent editions of Loutkář I met Kateřina. She was never a puppeteer herself, yet in university (DAMU) had developed an abiding interest in České loutkářství as a historical and intellectual subject. Kateřina is the kind of person you rarely find back in the USA. She obviously could have chosen any career path she wished. In America you might find a such a woman ensconced in the higher ranks of corporation or law firm. But here she was quite proudly a historian of loutkářství and now editor-in-chief of an old yet not particularly profitable puppetry magazine. That was perfect. Children study the set at Buchty a Loutky’s Vánoční raketa (Christmas Rocket). We discussed the situation of puppetry at present in Czech Republic. One thing that was clear, Josef Krofta’s generation in the 1970’s, the one that had made the most changes to puppetry during the peak of the communist suppression after the violence of the Soviet invasion of 1968, had nearly completely departed the stage. Švankmajer remained, but his puppets were in films and Kateřina explained that there was too broad a gap between the worlds of theatrical puppets and film animated puppets. A divide she hoped to help bridge. Now the idea of the multi-media show had taken over, mingled with the concept of object theatre. She still considered this to be puppetry, yet I detected a wistfulness for the more direct tactility of the traditional puppet. And indeed she felt that the puppet would eventually emerge again. 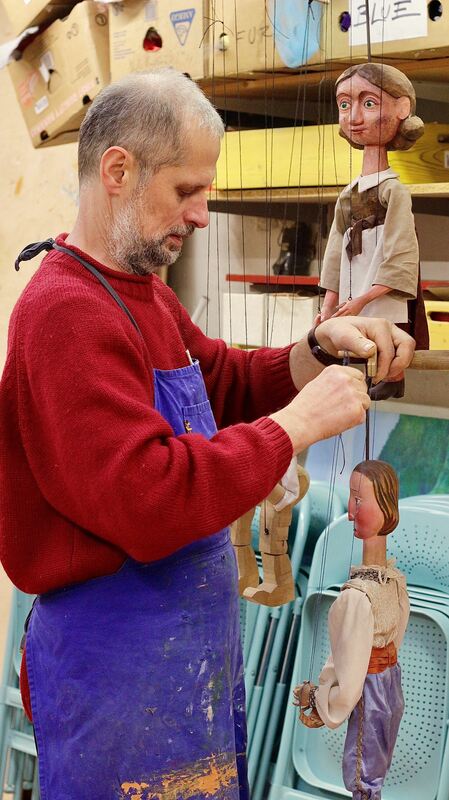 A sad marionette hanging up in Mirek’s studio. I also dropped in on Buchty a Loutky over at the Švandovo Divadlo for one show pro děti called Vánoční raketa, which translates into Christmas Rocket. And is about these alien creatures called Špidlíci who bake a strange cake to take to Bethlehem by rocket. And somehow that strange cake reminds me of what Buchty a Loutky has always been. An odd but lovingly made thing given to us. It was good to see Marek, Vit and Zuzana again. Radek was out of town and I was hoping to interview him about his puppet film Malý Pán. A young girl watches Marek, Vit and Zuzana close up during their Christmas show Švandovo Divadlo. 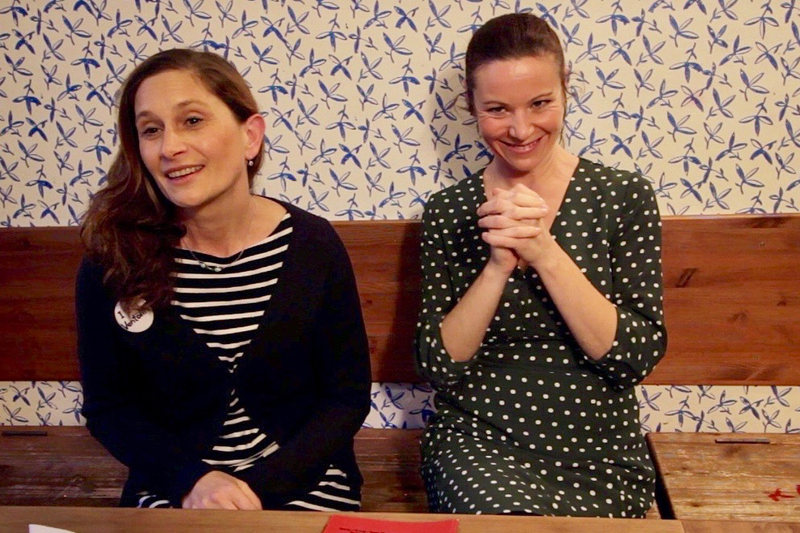 That evening I got together with Nina Chromečková at a cafe to discuss translations for the film. Which I felt I would get enough support for to get accomplished soon. We had an excellent conversation but soon it was time to get back to my little apartment over by the Národní Divadlo (National Theatre). Hear and see more from this visit!! All in all it was a long full week in Prague, making me miss it more than usual. The tourism, as it often has, sticks in the throat, but as a man peering into the world of puppets I am soon blissfully consumed by the real Prague, away from that one main artery of tourism, and onto the puppet stages where I find something irreplaceable and completely Czech. I look forward to visiting again. Nina Malíková invited me to come in June for the 90th anniversary of UNIMA. I’m not that far away now. Let’s see what happens by then. And so back to Paris, which is burning! Oh and if I don’t write before then Merry Christmas or should I say Merry Western Christmas. Christmas in Georgian is on January 7th. 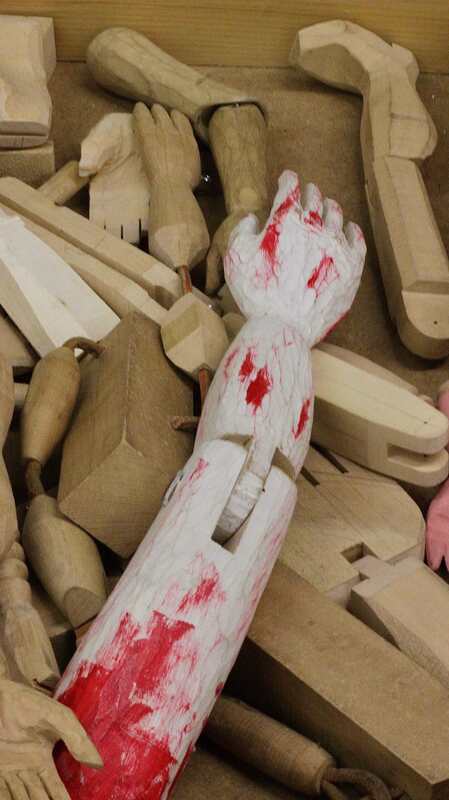 And if you are interested in puppet workshops in Prague with Mirek visit their Puppets In Prague site. And finally, for reasons that I won’t elaborate upon, finances remain challenging if I want to get this documentary finished. There are dozens of needs which will be surfacing early next year. If you feel helpful or generous remember me out here. If you wish you can give through PayPal. It’s the easiest way. It works internationally. And they don’t take as much as a crowdfunder does.